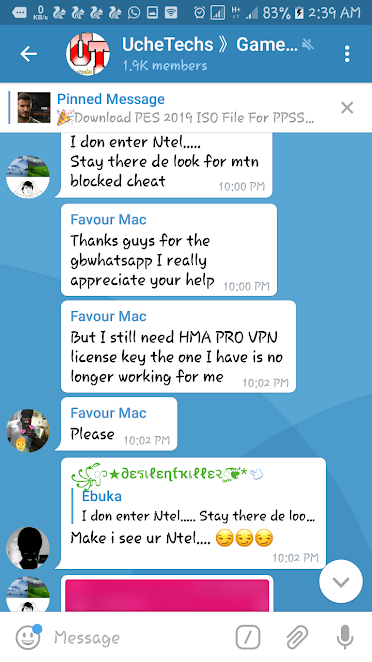 We have another new cheat in town and this time around, it's not the usual free browsing cheat that powers all apps and browsers on your phone but it is Telegram Cheat which works on 9Mobile Sim. With the help of tweaked APN settings, you can chat for free on Telegram. This Telegram Cheat works on Etisalat NG and doesn't work on other Networks. I have tested this tweak and now, you can chat for free on Telegram. This is definitely one good reason to cherish Telegram. You now have Free internet access on Telegram. Telegram is still the best social messaging platform becuase of its great features and tricks. You can input custom proxy on Telegram and even reduce disturbance by tweaking your privacy settings. Other cool stuff you can do are; Add members of up to 50000 members on Telegram compared to WhatsApp 256, creating telegram channels (Join Ours0, sharing of photos, videos and even sending funny Gif to group. My main aim for providing this 9Mobile Apn setting for Telegram Cheat 2018 is becuase many users don't have the app, due to many social media apps they have on their device, they don't want to install more. Eventually, you can chat for free on telegram if you have an Etisalat Sim. It will be wise to get one now and join us on Telegram. Also, Telegram Consumes Data like other social media app and it is really a Fun Social media platform to be online the way you are on Facebook. Meanwhile, many of us have tweaked our Telegram account to use lower MB by; disabling auto-playing of videos and auto download of image files. All you need to enjoy free telegram cheat is to change your 9Mobile APN settings to mobilinkworld.com, proxy to 127.0. 0.1 and port to 8080 and you have successfully bypassed the firewall. This works both on Android Smartphone and PCs. In the case of PC, you will need to change the web browser proxy settings like that of the Android APN. Also, it's a relief to know that no VPN is required to activate this 9Mobile cheat for free Telegram so it's easy and simple to setup and use. It won't drain your battery and you have nothing to loose here. This tweak was revealed on our Telegram Channel also, and you should now join our Telegram Channel. Click Here to join over 300 tweakers and Fans of this blog following our Channel.